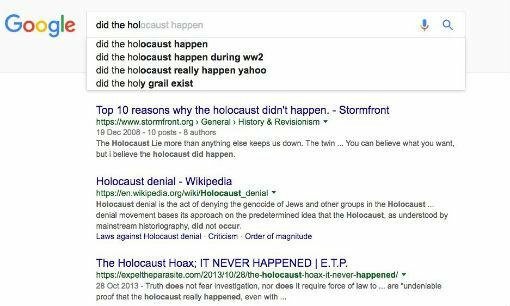 Google yields to the pressures and removed from the results of their search engine false arguments that the holocaust never existed. The technology company had to rectify and changes their algorithm to demonstrate that they are fighting against the false news, as promised a few months ago. To this question, Google threw -in their versions of USA, France, Hungary, Netherlands, Britain, among other countries, an article entitled:. “Top 10 reasons why the Holocaust did not happen”. The publication still appears in some countries, but Google said that it will gradually come across everywhere. “No. The Holocaust did not really happen. Six million Jews were not killed. Are you happy with that answer?” had written Carole Cadwalladr, the author of the complaint. The case took greater impact when it was learned that this publication, which dates back to 2008, had been written by a neo-Nazi website called Stormfront. This group, free of charge, was imparting their radical ideology and dangerous to millions of young people thanks to Google. With the changes of Google, the result questioned simply disappeared from the first page of results and is now in the middle of the second page. The purging of that and other results was confirmed by the search engine web site Search Engine Land. Google was in the eye of the storm on its algorithm in mid-December following an article in The Guardian, after the shock caused by the election of Donald Trump as president of the United States. The argument was explained that Trump victory never had the explicit support of some major media in their country, but which benefited by the proliferation of “false news” on the internet. A week after the vote, Facebook and Google had to promise that they would work to prevent these notes to take their sites.